Everyone's favorite sponge is back in an all new undersea adventure! 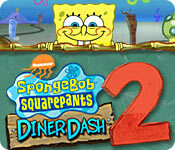 Help SpongeBob and the rest of the crew save their favorite hangouts from the greedy Sharkey Two-Times - one restaurant at a time. New characters, challenges, powerups, and a surprise restaurant await you in this fishy follow up to the original smash hit. Help Faye save her memories and family from the Fairy Queen of Dreams! Travel across multiple worlds full of magic and intrigue. After restoring the Atlantis World Museum you have been accepted into the Grand Pelasgian University to become an apprentice in Chronology!